Now this is a puzzle I can state with confidence that you won’t have seen before. It’s a Killer Sudoku Pro puzzle – i.e. 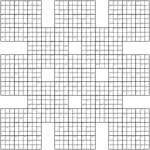 a Killer Sudoku with -, x and / regions too; but more than that it’s a Samurai Killer Sudoku Pro made out of 13 grids; and then further still the cages are toroidal, both around the edge of the grid and across the gaps. In other words, the Killer Sudoku Pro regions aren’t bounded by the actual physical layout of the 13-grids – they either jump the gap (in a straight line) or wrap around the edges of the puzzle (again in a straight line, albeit one that jumps to the other side!). If you like huge puzzles then you should really enjoy this, assuming you can print it out large enough to actually have a chance of solving it! For everyone else, I’ll post some more smaller puzzles soon! It’s not actually very difficult, logically, but completing the whole thing would still take a fair while – perhaps a couple of hours, I think. Place numbers into each dashed-line cage so that all together they give the total at the top-left of the cage once the given operation is applied – for subtraction and division start with the largest number in the cage and then subtract/divide-by the other numbers. Numbers can not be repeated in a cage. If you try it: Good Luck! 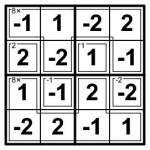 Place 11, 12, 13, 21, 22, 23, 31, 32 or 33 into each square so that the result of applying the specified operation to each cage is the given number. (Start with the highest number in the cage for subtraction and division cages). Also, can you obey the standard Sudoku constraints: place each of the 9 different numbers once per row, column and bold-lined 3×3 box? You can repeat numbers within a cage, however, if you wish (which is why it’s a Killer CalcuDoku, not a Killer Sudoku Pro, in my terminology! It’s also why it has solid cages, rather than dashed-line cages). 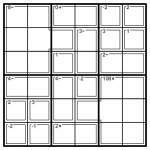 To avoid confusion I’m going to draw Killer Sudoku and CalcuDoku the way they always are – with dashed-line cages in the first case and bold lines between squares for the latter (replacing the traditional Sudoku bold lines). Then to distinguish the others, Killer Sudoku Pro will appear exactly like Killer Sudoku except that there will be additional operators within the grid (for operator-less ones I’ll include a question mark “?” or similar after each clue). Killer CalcuDoku, meanwhile, will appear exactly like today’s puzzle – with solid cages within the main puzzle. Now just to spice things up further, I’m going to mess around with how the puzzles work. Remember that the key difference between Sudoku and Killer Sudoku is that the digits now actually have value as well – so by fiddling with those values we can create an infinite range of new puzzles that solve in quite different ways. Here’s a Killer Sudoku with “all the signs”, or Killer Sudoku Pro if you prefer. If you’ve got any ideas for a better name let me know! As in a regular Killer puzzle, you can’t repeat a digit within the solution to any cage. Unlike in a regular Killer, all non-single cages specify the operation that is applied to produce the result given. If the operation is + or x then just add or multiply all the digits to give that total. For subtraction and division you must start with the largest number in the region and subtract or divide the other numbers from that to give the stated result (this is what you’d do intuitively, I think, but since these operations aren’t commutative it’s necessary to state this!) 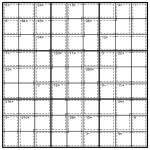 Other than that, regular Sudoku rules apply: place 1 to 9 into each row, column and bold-lined 3×3 box. The logic is once again simple, as a first example of this puzzle type, but I think the wider range of operations brings a freshness to the puzzle. Let me know if you agree (or disagree! ).